Wow Korea Day One in Busan. - MisTan IzZy | Travel & Lifestyle. Our journey started from Incheon International Airport, with the convenient of Airport Rail Train, we took an all stop train to Domestic Airport Gimpo. Buying the ticket was pretty easy as the automatic machine is available in 4 languages - Korean/English/Chinese/Japanese. Gimhae International Airport has gradually improved on developing amenities and facilities to provide a more comfortable travel experience for travelers, and added additional facilities for people with disabilities. There are plenty of restaurants, cafes, convenient stores and there is this food court selling some typical Korean Food. My Pork Cutlet Rice was pretty good! Moving on from lunch, the next few destination is a MUST VISIT places in Busan! You wouldn't want to say you have been to Busan without going to Gamcheon Culture Village - a village formed by houses built in staircase-fashion on the foothills of a coastal mountain, earning this village the nickname of "Machu Picchu of Busan." The many alleys cutting through this community are vibrantly decorated with murals and sculptures created by the residents. Gamcheon Culture Village is the most well-preserved cultural traces of Korean Nation. Gamcheon-dong, which in heats the suffering history since The Korean War, consists of the background of the Korean War and the territorial features, the hillside roads, have significant cultural value. The Gamcheon-dong's neighbourhood were built in the order of unique stairs-shape from Oknyeobong to the foot of Mr. Cheonmasan Stand. The virtue of building house can be sensed in Gamcheon-dong as each house is built not to block the front view of the house behind. To a modern city people, it can be a place to reminisce about past memories. Gamcheon-dong is a beautiful village where the residents live closely with and care for one another preserving the cultural tradition and archetypes of their people. Jagalchi Fish Market, located on the shoreside road in Busan's Jung-gu, is Korea's largest seafood market, selling both live and dried fish. After the Korean War the market solidified itself as a fish market. Most of the people who sell fish are women, so the vendors here are called Jagalchi Ajumma, "ajumma" meaning middle-aged or married woman in Korean. This market basically represents Busan and is famous throughout the country. If you wish to try all kind of raw seafood, this is the right place for you! You will find them selling mackerel, sea squirts and whale meat on wooden boxes along the road outside of the market and along the shore. BIFF stands for 'Busan International Film Festival', it's Busan's modern movie district that was newly transformed after a major renovations took place to become BIFF Squareon August 14, 1996. 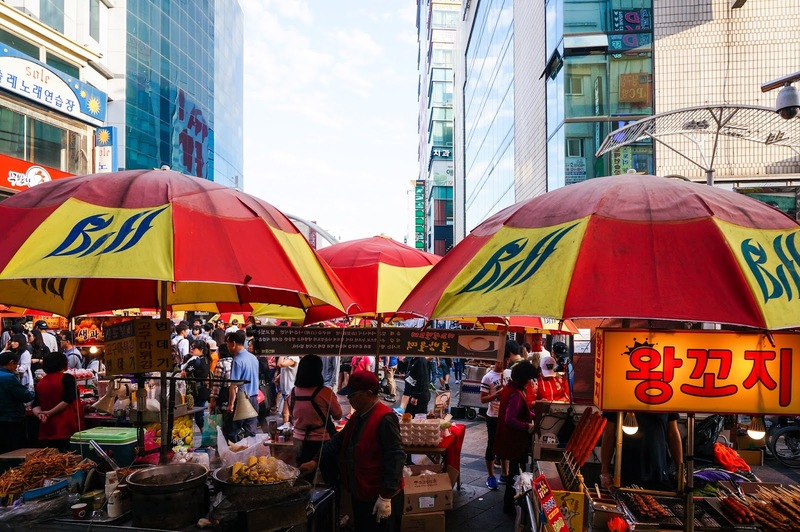 There are many local street food and snacks you could find here in BIFF Square, especially if you are looking for some traditional Korean snacks like Tteokbokki (Rice Cake) or Eomuk (Fish Cake). BIFF Square is somehow look alike Myeongdong in Seoul but however it is more relaxing to walk around when comparing both places. You can even walk up to Busan Tower from the square. 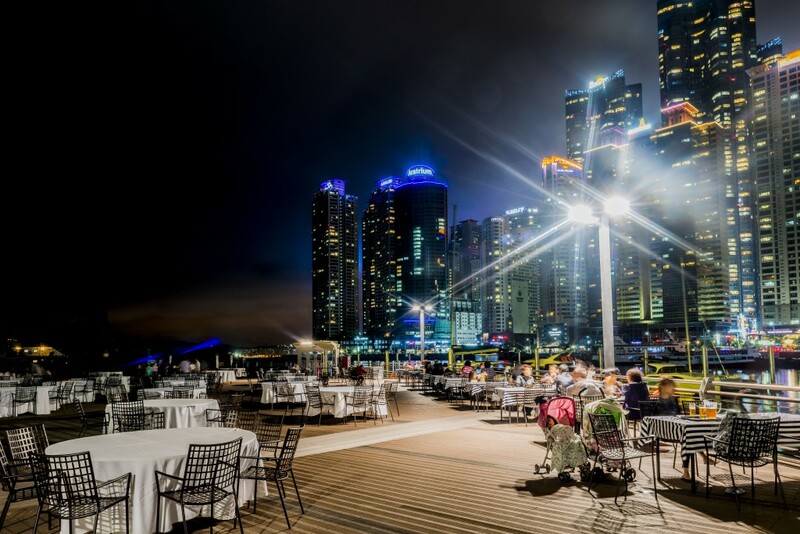 The Bay 101 is located in a culture and art complex in Haeundae area, attracting many visitors to the area thanks to the beautiful nightscape that it offers. It was a nice walk after a great dinner :) The Bay 101 gives me a feeling as if I am in Hong Kong's Avenue of Star. Today was indeed a very tiring day for each and everyone of us, but I am glad that we've enjoyed a lot of fun together! The most amazing part is that I get to enjoy many Korean Food during the buffet dinner session, from Gejang (Raw Crab) to Yukhoe (Raw Beef), Kimbab and Tteokbokki, even the desserts has got Sikhye (Sweet Rice Punch)!